I often wonder how much time I’ve spent writing and responding to emails over the years. Perhaps five.sentenc.es may have a solution to reducing the amount of time spent in my inbox. I got my very first email address in 1997 when I started my MTh in Ministry at the University of Edinburgh. It was [email protected]. Other than my fellow students, most of whom I saw on a day-to-day basis at New College, I only knew about four or five other people who had email back then. Over the last few years I’ve made a concerted effort to reduce how much email I receive. I’ve unsubscribed from all but the essential email newsletters (and even then I could reduce things further, or move those to a different email account) and I now have a folder called “Action” in Outlook/Exchange where I store the emails that I need to reply to. It’s certainly an interesting solution. I’m sure there are some situations where it won’t work, where you simply need to write more, where telephone or face-to-face conversations are not convenient (which may be a better forums for lengthier discussions). I’m going to give this a go for the next month or so and see how I get on. Choose your weapon: two, three, four or five sentences. 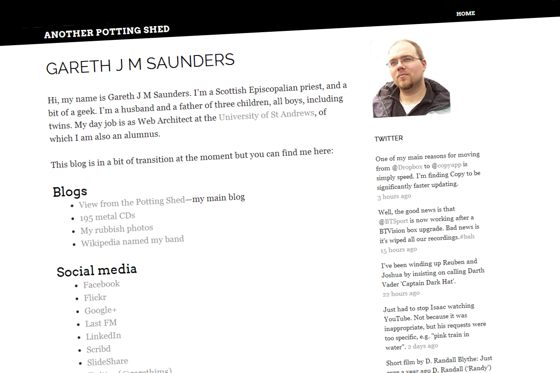 Over the last few years I’ve had a second blog called Another Potting Shed, hosted on WordPress.com. This morning I migrated all my posts from it into this blog, and it’s currently just a holding site until I figure out what I want to use it for. I’ve never been entirely clear about the purpose of this second blog, and to be honest I only started it so that I could have a WordPress.com account and check out what was going on there. In the meantime my main blogging will take place here and I achieve some clarity. I’m already feeling happier about the situation. Perhaps it’s simply because I’ve made a decision and have done something about it; I’ve been pondering this for months. A few months ago I came across a productivity technique called Pomodoro. The name comes from a Pomodoro kitchen timer that the creator of the technique first used; pomodoro is Italian for ‘tomato’. Choose a task to complete. Work on the task, uninterrupted, until the timer rings. Take a short break (5 minutes). Every four ‘Pomodoros’ take a longer break (15-20 minutes). I thought I’d give it a go and not having a kitchen timer to hand went to look for a Windows 7 gadget that would give me this functionality. But I really didn’t like any of the specifically Pomodoro gadgets. They were either ugly (sorry), took up too much room, offered more eye candy than functionality, or were locked into a strict 25 minutes/5 minutes cycle. First off it is compact and just looks great. The timer has two states (white and blue). Set the white timer to how ever long you want to focus on work, the length of your break is set using the blue timer. An alarm goes off when the timer reaches zero; or, alternatively, the timer can control your iTunes, pausing it for the break. The timers are easily set by clicking and dragging the hours, minutes and seconds digits up or down with the mouse. So far I’ve found it a very useful little gadget. I’ve been meaning to blog about life for ages but since Reuben and Joshua were born in November 2008 other things took more of a priority. Things like attending to twin boys, eating, getting enough sleep, and generally trying to muddle through the days. I’ll likely write more about that in the future. 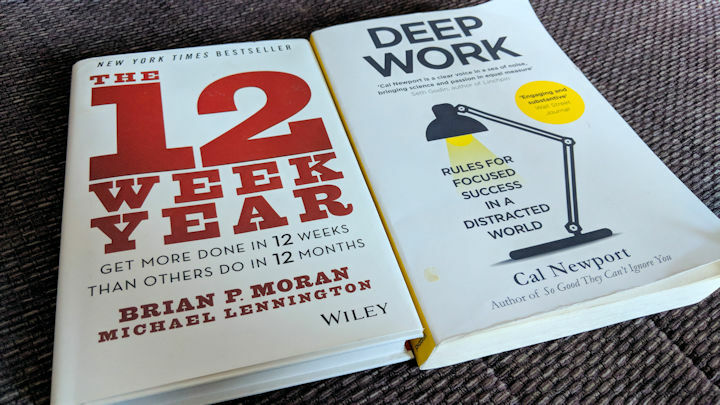 Over the last few months I’ve been working at simplifying life as much as possible, and being a good Getting Things Done / Take Back Your Life disciple and disengaging from projects and tasks that I knew I wouldn’t/couldn’t complete or which were no longer priorities. It’s felt good. That’s given me more of a focus on the things that I do want to do. Sorting out my web server was one of those things. I suspect that I would have blogged more about it at the time (and I now wish that I had) but I made a promise to myself that I wouldn’t blog again until I’d upgraded my server. Of course, that took a good few months longer than I had anticipated (doesn’t everything these days?). In February I moved from Webfusion to Heart Internet, after an abortive attempt to simply upgrade to a better hosting package at Webfusion. The killer feature that was missing from the Webfusion package was subdomains; I didn’t want to lose my www.garethjmsaunders.co.uk URL that I’d just had printed onto a custom-made laptop skin. So far my experience of Heart Internet has been excellent. The most pressing reason for moving to a better server was to enable me to upgrade WordPress, the software that manages my blog. My old host had a bunch of really out-of-date features (MySQL 3.2 and PHP4) which just wasn’t enough to run the latest versions of WordPress. What a relief to be able to upgrade from WordPress version 2.0.11 to the latest version 2.9. And wow! 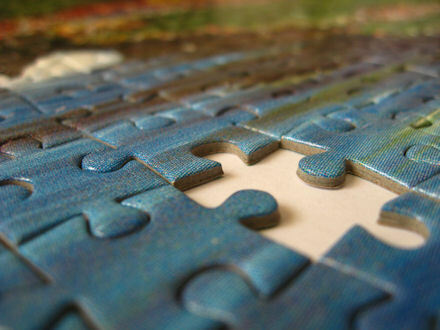 there have been quite a few changes to WordPress in the interim: the addition of widgets and tags, as well as critical changes to the main API, a much nicer UI, etc. So many changes in fact that my old theme broke. So that had to be fixed. The upgrade was pretty pain-free thanks to WordPress’s infamous 5-minute install and upgrade script. (I tested it out first, of course, on my localhost machine using XAMPP.) The only thing that I missed was matching the database character set encoding. It was set to ISO-8859-1 (Latin-1) rather than UTF-8 (Unicode) so there are still a few odd character combinations on the blog that I need to track down. WordPress now has tags. Back it the day it only supported categories so I, like many other WordPress users, created tens of categories to organise what I was writing about. I had 88 categories. I found a tremendous plugin called Batch Categories which let me quickly (by which I mean over the course of two days, rather than weeks if I had to edit each post individually) move groups of posts from one category to another, and also add tags to groups of posts. I’m really keen to redesign my blog theme but I’m going to hang off on that for the time being. I’ve got a couple of other things that I want to complete first. The first thing is to complete work on what started as a plugin for the Blueprint CSS framework and which is now turning out to be a combination of different parts of my favourite CSS frameworks. Once that’s done I’m going to work on a complete reworking of my main website www.garethjmsaunders.co.uk. The last time I did any serious work on it was, I think, probably around 2003. The code has a very serious dose of ‘classitis‘. One of my biggest drivers is the number of emails and telephone calls that I still get for information about and software for the Psion range of PDAs. I want to create some space for myself by putting a lot more of that information on my site, in a way that it can be found more easily.